The aim of National Institute of Wind Energy under its Wind Resource Assessment & Offshore Project is to locate wind rich sites in the country through field measurements for the development of wind energy utilization. The data generated thus from all parts of the country is to be consolidated for the preparation of a National wind resource atlas. Apart from this all wind resource related studies on–land and off-shore using other techniques like models and satellite information are also to be used for the exploitation of wind energy. The division is involved in activities related to the development of offshore wind power projects in the country by using the latest and advance technologies currently available in the world. In order to identify wind farmable sites in the country, the Government of India launched a national wind resource assessment programme in 1985. The National Wind Resource Assessment Programme was designed for the selection of windy sites, procurement of suitable instruments, design and fabrication of 20 m tall masts, their installation at the selected sites and collection & processing of the data's. Nodal agency of each state also actively participated in the implementation of the programme. After the establishment of the National Institute of Wind Energy (formerly, C-WET) in Chennai, the National Wind Resource Assessment Programme has been transferred to NIWE and the activities of FRU-IITM was terminated. Since 2001 the National Wind Resource Assessment Programme is being executed by NIWE on behalf of MNRE. Under the programme, NIWE has commissioned 50m, 80m, 100m and 120m height masts to collect dedicated wind resource data at multi-level. All the states and the major union territories are covered under this programme. More stations are being added every year so that more uncovered areas in states are studied scientifically. The data collected also serves as data bank for the preparation of national wind potential maps and other research purposes. Under the programme, cumulatively 877 stations have been established as on December 2018. The Ministry is continuing this project through NIWE in association with State Nodal Agencies. As a part of the programme, in order to provide the authentic knowledge of the wind energy availability in a region of interest to the stakeholders, the Ministry decided to publish the data in a book form. Nine volumes of Wind Energy data books which provide extensive information of the sites where actual wind measurements carried out have been published so far. As a part of outcome of this study, wind power density maps have been prepared based on the measurements and meso-scale models. In 2005, the wind power potential for 10 states at 50m has been estimated with relevant assumptions. From the discrete values of WPD at individual locations, the wind power potential over an extended area of land have been estimated. In the year 2010, Indian wind atlas was prepared by NIWE with a combined effort from RISO-DTU, Denmark using much sophisticated meso-scale modelling technique called Karlsruhe Atmospheric Meso-scale Model (KAMM). Subsequently, in 2015 NIWE has prepared the Indian Wind potential map 100m AGL (Above Ground Level). Tailor made training program on resource assessment to the industry. Under take consultancy services on wind resources assessment, micro survey of wind resources, micro sitting and Detailed Project Report (DPR) for wind farm developments. Monitored wind speed & direction at 877 sites in the country. Published Wind Energy Resource Survey Vol. V containing wind data of 34 wind monitoring stations in ten states. Published Wind Energy Resource Survey Vol. VI containing wind data of 55 wind monitoring stations with CD in sixteen States/Union Territories. Published Wind Energy Resource Survey Vol. VII containing wind data of 26 wind monitoring stations with CD in six states.  Published Wind Energy Resource Survey Vol. VIII containing wind data of 76 wind monitoring stations. Published Wind Energy Resource Survey Vol. IX containing wind data of 35 wind monitoring stations. Conducted Micrositing / due diligence for more than 8500 MW (total) wind farms in the Country. About 1000 Nos. of Private Wind Monitoring Stations have been vetted. 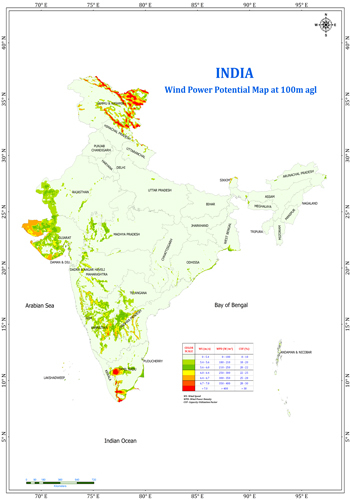 Indian Wind Potential Map at 50m, 80m and 100m has been prepared and published. Under the direction of MNRE, NIWE has assessed India's wind power potential at 100m hub height with scientific rigor and based on authentic latest available data-sets of wind as well as land geologically spread across India. This information is essential for the Policy makers, Private players, Government Agencies and other stakeholders of the industry to move towards achieving the ambitious goal of 60,000 MW of wind power by 2022 as envisaged by the government. NIWE (formerly C-WET) had already performed the potential estimation study corroborating meso-scale derived wind maps and micro-scale measurements and released Indian Wind Atlas at 50m and indicative values at 80m hub heights with 5km resolution in April 2010 in collaboration with RISO-DTU, Denmark. India is blessed with a coastline of about 7600 km surrounded by water on three sides and has bright prospects of harnessing offshore wind energy. The Government of India notified the National Offshore Wind Energy Policy as per the Gazette notification dated 06 October 2015 to provide a policy framework for the exploitation of offshore wind energy up to the Exclusive Economic Zone (EEZ) of the country. Ministry of New & Renewable Energy (MNRE) is designated as the Nodal Ministry for development of Offshore Wind Energy in India and National Institute of Wind Energy (NIWE) is identified as the Nodal Agency for the development of offshore wind energy in the country. NIWE has carried out preliminary assessment along the Indian coastline through 74 nos. of meteorological mast measurements and through satellite data assessment, which showed reasonable potential along the Gujarat and Tamil Nadu coast. Towards validating the preliminary assessments, NIWE has installed a 100m high guyed lattice mast in the coastal line of Dhanushkodi, Rameshwaram which is a narrow piece of land jutting towards Sri Lanka and surrounded by water in three directions. 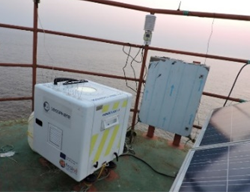 In order to validate the wind potential at the zones demarcated under FOWIND project, a LiDAR-based offshore wind measurement was initiated by NIWE in Gulf of Khambhat, Gujarat Coast. The data measurements are underway since November 2017. NIWE has carried out Geophysical survey at about 365 sq.km (70 sq.km under FOWPI project) in Gulf of Khambhat, Gujarat for the proposed 1 GW offshore wind farm project to ascertain the nature of subsurface and soil profile available at recommended depths for the design of foundation of offshore structures. Under this project NIWE proposes to carry out extensive LiDAR based offshore wind resource assessment off the Gujarat coast and Tamil Nadu coasts. In addition to this, NIWE proposes to carry out the Oceanographic / Hydrographic measurements, in and around the LiDAR platforms or suitable locations off the Gujarat coast and Tamil Nadu coast to understand the sea-state conditions, which are envisaged as equally essential and necessary to design the foundation of the Offshore wind turbines, to plan for Installation & other survey activities, and to understand the Weather Window for Operation and Maintenance planning. These simultaneous measurements will help to quantify the wind potential and understand sea-state in a fast-track manner, for effective demarcation of the offshore wind energy blocks. In Gujarat, two locations have been identified for the measurements in Zone A and Zone B2. In Tamil Nadu, two locations at zone B1 and zone D1 have been identified and the clearance process has been initiated. Reliable background information on the availability of renewable resource and its geographical variation will play a major role in achieving the government’s ambitious targets. As the wind speed increases with respect to height, the hub height extension is being looked into one of the effective solutions to enhance the energy yield from the wind turbines. With the technical advancements, the modern day turbines have reached the hub height of 120m to 130m and a further enhancement in hub height is foreseen, which would require higher height maps. Studies have also revealed that solar and winds are almost complementary to each other. Hybridization of these two technologies would help in minimizing the variability apart from optimally utilizing the infrastructure including land & transmission system and a Hybrid potential map in this regard would be very much helpful for the stakeholders to identify suitable sites for further investigation. NIWE proposes to prepare indicative Renewable Energy potential maps (wind maps at 120m & 150m and Hybrid maps) through advanced numerical meso-scale modeling techniques and validate the maps with Integrated wind and solar masts and remote sensing in-situ ground measurements to move towards achieving the ambitious goals as envisaged by the government. To cope up with the ever increasing hub height of the wind turbine, NIWE has taken a new initiative to prepare the 120 m wind potential map.